Supermarket shenanigans | Help! I live with my Italian mother in law! ← Give the cat coffee. Cosa? Genoa, Italy is full of old people. Sly, slow, grumpy, cranky, old people. In fact, this area of the North has the highest population of old buggers in all of Italy. Now don’t get me wrong, I like old people, really, I do. I just don’t like the cranky ones, that’s all. The sly ones are the ones that keep me entertained on a regular basis. They use their canes to push people out of their way on the bus and I swear I saw one used to trip someone! Oh, and then there are the ones who use them to hold their place in a cue while they sit down. Those ones I cannot blame, I hate waiting in lines and standing forever; I get a sore back just thinking about it. And I will always be the first to offer up my seat on the bus because the bus drivers are all maniacs and don’t give a flying crap if they slam on the brakes and send some old guy from the back to the front in a nanosecond. But then there are the supermarket foxes. These ones I love the best. I shop at a local supermarket that is known for being economical. I do this because it’s a lot cheaper and nearest to my house even though the selection leaves me going home hungry most nights. On several occasions I have seen these old people plead to jump the cue because they only have a few items. This amuses me but also annoys me too. I mean really, what’s their hurry? Are they going to miss the opening credits to Judge Judy or something? Then there are the scale tippers. This one was a new one on me and I got to not only witness it first hand but also play a small part in this lady’s shenanigans. We were weighing our veggies when she strained to read the code to enter for eggplant. I obliged and told her the number…then she put her bag onto the scale and innocently peered at the numbers again. Oddly, she was still holding one big eggplant in her hand. I thought why doesn’t she also place that one in the bag? I walked over and showed her which number to press. She didn’t budge, so I pushed the number for her and she grabbed the sticker and placed the last eggplant in the bag. Huh, not exactly the helpless granny type after all. I made my way to the front cashier and lo and behold there was the sly fox in front of me cashing out. The cashier grabbed the bag of eggplants and put them on the scales. Obviously we had a slight discrepancy. The old fox looked over at me with a twinkle in her eye and winked…I guess this time she got busted. But no doubt, she will try that trick again. 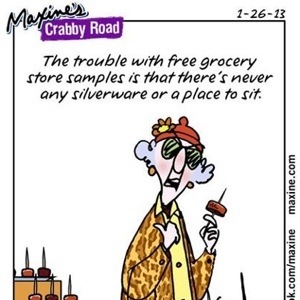 This entry was posted in Food, Italian Culture and tagged Grocery shopping, old ladies, tricks. Bookmark the permalink.